Maruti Suzuki Desert Storm Rally 2012 starts from 20th Feb 2012 in India. This rally includes a overall distance of 3500 Km spread over 6 days and 9 high speed sections. Total number of vehicles participating in the 2012 Desert Storm Rally is 150 which consists of 130 four wheelers, 16 two wheelers and quad bikes and 4 trucks. This is the first time trucks are being included for the Desert Storm, four trucks have confirmed participation in the ENDURE category. The 10th Maruti Suzuki Desert Storm Rally was flagged off here today amongst much fanfare, excitement and revving engines. The rally is all set to raise the bar of professional motorsports in the country yet again. Ace motorsport enthusiasts will compete in extremely harsh and inhospitable conditions. The tough off road rallying experience brings out the best of man and machine. This year, in addition to regular participants, Maruti Suzuki has also fielded its employee teams for the rally, including a Ladies’ team driving the all new Swift. The rally also has participation by teams from several wings of the Indian armed forces. Based on the endurance levels, the rally is divided into 3 categories XTREME, XPLORE and NDURE. At all levels it tests the nerve and grit of all participants and their machines. 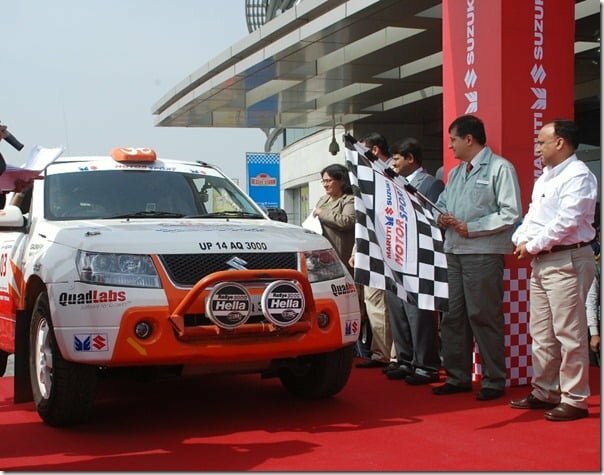 Maruti Suzuki Desert Storm is being organized in partnership with Northern Motorsport for the 10th year in the running. Northern Motorsport is one of the leading motorsport organizations of India. It organizes a series of challenging motorsport events including the Maruti Suzuki Autocross, the Rally of the North, etc..